WASHINGTON (AP) — President Donald Trump on Sunday offered a scattershot response to the sweeping post-inauguration protests against his new administration, sarcastically undermining the public opposition and then defending demonstrators’ rights a short time later. “Watched protests yesterday but was under the impression that we just had an election! Why didn’t these people vote? Celebs hurt cause badly,” tweeted Trump, at 7:51 a.m.
Ninety-five minutes later, he struck a more conciliatory tone. “Peaceful protests are a hallmark of our democracy. Even if I don’t always agree, I recognize the rights of people to express their views,” the president tweeted at 9:26 am. While Trump has said that he considers Monday his first real day in office, his discordant reaction underscored that the new president has little intention of changing the defiant approach that defined his campaign – particularly when it comes to the media and those who oppose him. The dueling tweets marked his administration’s first response to the more than 1 million people who rallied at women’s marches in Washington and cities across the world. 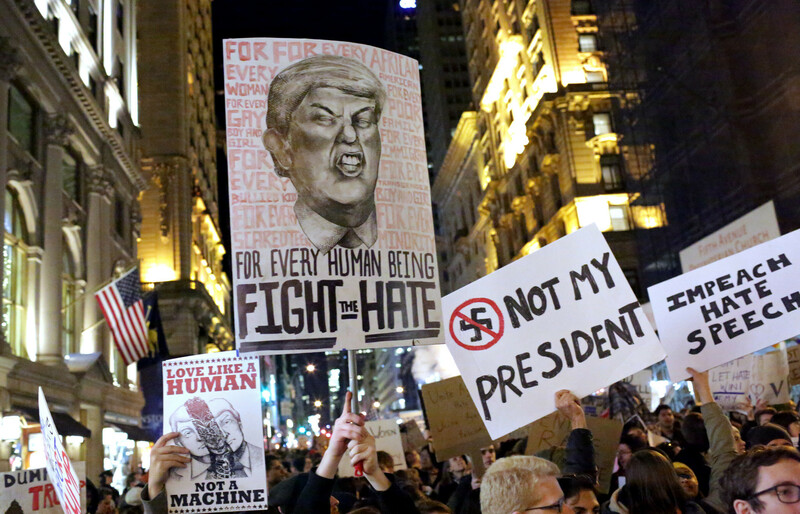 Hundreds of protesters lined the street as Trump’s motorcade drove past on Saturday afternoon, with many screaming and chanting. The Washington rally appeared to attract more people than attended Trump’s inauguration on Friday, but there were no completely comparable numbers. Regional transportation officials tweeted on Sunday that 1,001,616 trips were taken on the rail system on Saturday. Metro spokesman Dan Stessel had said that on Friday, the day of Donald Trump’s inauguration, just over 570,000 trips were taken on the rail system. Even suggestions of weak enthusiasm for his inauguration clearly irked the new president. Trump spent his first full day in office berating the media over their coverage of his inauguration, using a bridge-building visit to CIA headquarters to air grievances about “dishonest” journalists and wildly overstating the size of the crowd that gathered on the National Mall as he took the oath of office. Trump said throngs “went all the way back to the Washington monument,” despite photos and live video showing the crowd stopping well short of the landmark. Aides also made clear that Trump will not release his tax returns now that he’s taken office, breaking with a decades-long tradition of transparency. Every president since 1976 has released the information. Throughout the campaign, Trump refused to make his filings public, saying they’re under audit by the Internal Revenue Service and he’d release them only once that review is complete. Tax experts and IRS Commissioner John Koskinen said such audits don’t bar taxpayers from releasing returns. Trump’s Sunday plans were to include a telephone conversation with Israeli Prime Minister Benjamin Netanyahu, who told his Cabinet that the call would cover the Israeli-Palestinian conflict, Syria, Iran and other issues. Also on tap: the swearing-in of presidential assistants and a reception for law enforcement officers and first responders who helped with his inauguration. Sunday also was his 12th wedding anniversary. His chief of staff, Reince Priebus, said on “Fox News Sunday” that Trump would spend his first full week in office undoing some of his predecessor’s agenda and planned to sign executive orders on immigration and trade. Priebus did not provide specifics but during the campaign, Trump pledged to scuttle trade deals such as a pending Asia-Pacific agreement and overturn Obama’s executive order deferring deportations for 700,000 people who were brought into the country illegally as minors.